Non-medicinal Ingredients: olive oil, soybean oil (non GMO). Softgel: gelatin, glycerin, caramel. AOR™ guarantees that all ingredients have been declared on the label. Contains no wheat, gluten, corn, nuts, peanuts, sesame seeds, mustard, dairy, eggs, fish or shellfish. This formula contains the complete, balanced, natural vitamins that form the E complex. The four tocotrienols and four tocopherols that comprise this complex, ensure one can access the full benefits of vitamin E.
Pro E-Complex's antioxidant function has been linked to reducing risk factors for cognitive decline, vision concerns, cardiovascular support, and even prostate cancer. Individuals who suffer from malabsorptive disorders such as cystic fibrosis, chronic bowel diseases, gastrectomy or gastric bypass may be susceptible to vitamin E deficiency and would benefit from supplementation. Many commercial supplements also use the less active synthetic d- alpha tocopherol. 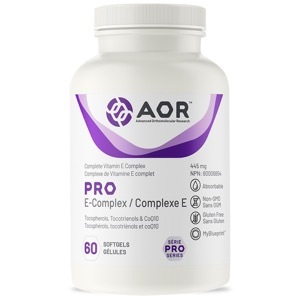 AOR's Pro E-Complex combines natural and active tocopherols and tocotrienols into a single balanced formula for maximum benefit. Adult Dosage: Take 1 softgel daily with food. Cautions: Caution in patients taking blood pressure medication. Contains soy and sulphites. Do not use if you have these allergies.